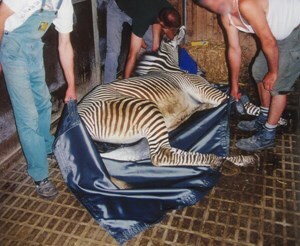 injured and comatose animals either for transportation or procedures. It´s made of fantastic strong fabric and will be irreplaceable in relocation of animals. With 4 strong and solid lift- and raising straps at both long sides. Safe working load up to 250 kg. Any special wishes / custom made stretcher are available.